When Susan Fowler, daughter of Jasper, signed her name to a simple, legal document in 1849, I do not think that she could have ever imagined the sheer joy I would feel when my eyes fell upon that document one hundred and sixty seven years later. Yet, she is part of my journey into the past, and even from her grave, she has helped me put another piece into the wonderful puzzle of my heritage. Jasper Fowler was the oldest son of Ephraim and Nancy Fowler. He was born circa 1785 in Virginia or possibly South Carolina, and he died before 1849 in Union County. The chart above represents my theory about his family since the names of his wife and children were never recorded with him in a census record. I have found a few documents in the Union County, SC courthouse which help support, and even offer a little proof, of my theory and speculation. In 1822, when Ephraim Fowler penned his last will and testament, he also sold 50 acres of land to his son Jasper. From the land transaction, we learn that Jasper had already been living in the home on the land. Perhaps Ephraim wanted to make sure that his son and his son’s family would have a place to live. Ephraim must have known that his death was imminent as his will was probated very shortly after he signed it. Jasper first appeared in the 1810 Union County census, age 16-25, with a wife and three young children. To confuse us, there are two Jasper Fowlers in the 1820 Union County, SC census. The households are almost identical and I do not know if the household was recorded twice or if there were two Jasper Fowlers in Union County that year. If there were two, one of them disappeared by 1830, never to be seen again. Jasper was recorded in the 1830 Union County census, still with a wife and now older children. I will not go into the range of ages for these census records, as the chart above pretty much explains things. The last census record that Jasper was to be found is the Union County, SC census of 1840. There is a very important clue in 1840. There were two persons labeled as idiotic in the Jasper Fowler household. More on this a little later….. I remembered the name Lemuel Johnson from previous research, as he had married Catherine Fowler, daughter of John “the hatter” Fowler. Also, Wyatt Johnson’s son William married Frances Fowler, daughter of Lemuel Holter Fowler and Milly Mitchell. Lemuel was the son of John “the Hatter” Fowler. I thought the document to be most interesting with a Fowler, a Knox, two Gaults, and four Johnsons signing it. I decided to find out who these men were and why were they appointed as legatees of the widow Lois Johnson. I discovered that Zachariah Johnson, WH (Wyatt) Johnson, Jordan Johnson, and Lemuel Johnson were the sons of William H. and Lois Johnson. I then discovered that William “Drummer” Gault had married Frances Johnson, daughter of William and Lois Johnson. Isaac Knox also married a daughter, Mary, of William and Lois Johnson. I could only find the first name of John Gault’s wife, Elizabeth. Some family trees have her surname as Littlejohn, and some as unknown, but the fact that John Gault signed the document makes me think that Elizabeth was a Johnson. That only left Jasper Fowler to account for. Why did he sign this document, and why was his name first?? Logic tells me that Jasper Fowler was married to a daughter of William H. and Lois Johnson. I can think of no other reason why he would have been involved in this legal action. Now, why the particular order of the signatures? I believe that it was due to the birth order of the children! Jasper was born circa 1785, and the first census he appeared in was 1810. His wife, the Johnson daughter, was close to him in age, and was probably the oldest child of William and Lois. Zachariah Johnson was born in 1789, making him the oldest son, and the second person to sign the document. Frances Johnson was born circa 1790/1791. She and her husband William Gault were in the 1810 census, confirming that she was an older child of William and Lois. William Gault signed the document in the third place. W.H. (Wyatt) Johnson was born circa 1791/1792, was recorded for the first time in a census in 1820, and was the fourth to sign the document. Jordan Johnson, born 1794, recorded in the 1830 census for the first time, was the fifth person to sign. John Gault, (a brother of William Gault) was born circa 1797. He was married to Elizabeth, born circa 1798. I have to believe that Elizabeth was a daughter of William and Lois Johnson. It is the only logical reason that John Gault was the sixth person to sign the document. Isaac Knox, born 1797, was married to Mary Johnson, born 1801. They married young and were in the 1820 census. Isaac was the seventh signer of the document. Lemuel Johnson, born in 1806 and the youngest of all the children, had the last signature on the document. He married Catherine Fowler (daughter of John “the Hatter” Fowler) and they were first recorded in the 1830 census. Further evidence, though circumstantial as it may be, is the location of the Jasper Fowler household to the Johnson offspring and their spouses. Not forgetting the two idiotic persons in the Jasper Fowler household of 1840, let’s take a look at what was going on in 1850…….. Heads of Household 1850……Fowlers and Johnsons and Gaults…….oh, my! Lemuel Johnson (brother of Jasper’s wife) Lemuel was married to Catherine Fowler, daughter of John the Hatter. I feel fairly certain that the image above gives us a list of most of Jasper’s children. Lemuel was listed as head of household; Zachariah was older but listed as idiotic. Mary was also listed as idiotic. Susan is the only one that has been fully documented. Note the Nat Kelly in the household. He was a free black man, and he and his parents, Samuel and Maria Kelly, often lived and worked on Fowler land. I do not know who Caroline Hill could have been. 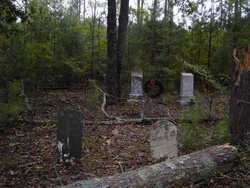 Jasper’s son William Fowler, his wife/cousin Charity Fowler (daughter of Jasper’s brother John), and their family were living nearby. William and Charity later had a son named Jasper, which is one of many reasons that I believe this particular William was the son of Jasper. Zachariah Fowler (1803- after 1850) perhaps named after Zachariah Johnson. Greenberry Fowler (b. 1837) 1850 census with parents; 1860 census…in jail; died in Civil War?? Gillman Fowler (1863– after 1930) 1870 census with parents; 1880 census with mother Charity; 1900 census living alone; 1910 census living with Ivey family; 1930 informant on his brother John’s death certificate. 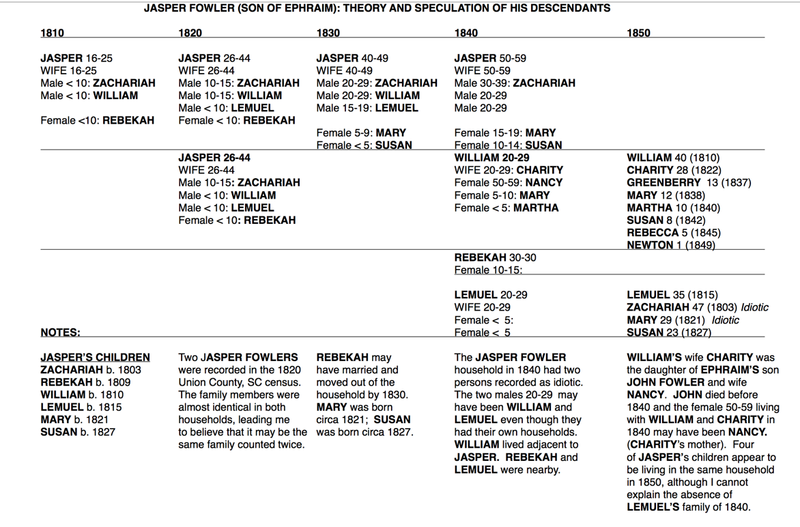 Although it is my belief that Jasper Fowler and his Johnson wife had six children — Zachariah, Rebekah, William, Lemuel, Mary, and Susan — with the exception of Susan, my belief is only speculation based on good circumstantial evidence. Susan is the only child of Jasper that I have been able to document. I recently discovered a document in the Union County Courthouse from 1849, whereas Susan Fowler, daughter of Jasper Fowler, son of Ephraim Fowler sold her 1/8 portion of Ephraim’s estate that she had inherited from her father Jasper to William Bevis. Not only do we learn the name of one of Jasper’s children, we also learn from this document that her father Jasper had died by 1849. Other than the above document, I have found Susan Fowler in only two other records: the 1850 and 1860 Union County, SC census. As stated previously, in 1850, Susan Fowler lived with her probable siblings, a free black man named Nat Kelly, and Caroline Hill. In 1860, Susan Fowler headed a household that contained her seven year old son Danison Fowler and a male infant one month old. The family was enumerated on July 23, 1860. Note that the next door neighbor was a man named Thomas R. Miller. I would like to step back for moment to examine the relationship between the Ephraim Fowler family and the William Bevis family. My reasons will become evident shortly. Ephraim’s daughter Sarah Fowler married John Hames. Their daughter Zilla Hames was the second wife of William Bevis. Ephraim’s son Jasper Fowler was the father of Susan Fowler, making Zilla Hames Bevis and Susan Fowler first cousins. We know that all of Ephraim’s descendants sold their shares of Ephraim’s estate to William Bevis during the years 1846 to 1849. (See my article “The Final Estate Settlement of Ephraim Fowler: Darkas, Mahala, Dorcas and Charlotte”) There was obviously a close relationship — a family relationship — between William Bevis and Ephraim’s children and grandchildren. I have seen the transcription of the William Bevis family bible. There is an entry that “B.F. Fowler (in pencil ‘Miller‘) was born July the 2nd, 1860″. Who was this B.F. Fowler/Miller? He was the unnamed male infant, age one month in the Susan Fowler household of 1860. He was the son of Susan Fowler, daughter of Jasper. Was his father the Thomas R. Miller who lived next door to Susan Fowler in 1860? Susan Fowler and her sons Danison Fowler and B.F. Fowler/Miller were not counted in the 1870 census. I can find no record of them. Perhaps Susan had died before 1870. Since her sons were still living and would have been seventeen and ten years of age, it is more likely that the census taker just overlooked them. In 1880, William Bevis, now a widower three times, lived with his daughter Eliza Bevis McNease and her family. Benjamin Miller, aged 20, also lived in the household. When one considers that Benjamin (Fowler) Miller’s date of birth was recorded in the Bevis family bible and that he was living with William Bevis in 1880, it becomes apparent that there was a very close tie. Did Zilla Hames Bevis raise Benjamin along with her own children? Benjamin F. Miller was a veterinarian. He was married twice and had two sons. I do not yet have a date of death for him but he died between 1930 and 1940. Benjamin Miller married Sarah Ann Carter, and they had one son, Henry V. Miller, born in 1885. Ben and Sarah were still married in 1910, but there were no children in the household. Although I have not found a date of death for Sarah, she must have died shortly after the 1910 census was taken. By 1920, Benjamin had married Elizabeth Wright Teague, a widow with three children, Newland, Grace, and Jesse. These children were sometimes recorded as Millers in documents even though their father was a Teague. It must be mentioned that Grace Teague married James Clarence Fowler, a descendant of the Henry Ellis Fowler family. Benjamin and his second wife Elizabeth had one son, John Calhoun Miller, born in 1914. Susan Fowler was not recorded in the 1880 census. Was she still living? I do not know. Danison Fowler was also not recorded in the 1880 census? Was he still living? Absolutely. Danison Brown b. 1829 did, in fact, live near Susan Fowler in 1850. I did consider that perhaps he fathered Danison Fowler. After a little research, the possibility went out the window. This Danison Brown had moved to Walker County Georgia circa 1852. He and his wife had several children between 1853 to 1860, all born in Georgia or Mississippi. Danison Brown died in Mississippi in 1909. There is no evidence, real or circumstantial, that he ever moved back to Union County, South Carolina. Danison Gadberry Brown b. 1849 lived with his parents and siblings in household number 939 in Union County in 1850. His father, born in 1822, was named Annanias Brown, and very likely a brother or close relative of the Danison Brown who moved to Georgia. Susan Fowler lived in household number 945 in Union County in 1850, only six households away from the Brown family. Was Annanis Brown the father of Danison Fowler? Annanis Brown and his family had moved to Sevier County, Tennessee by 1860. Census records indicate that he and his wife had a daughter born in 1853 in Tennessee. If so, it is likely that he was not the father of Danison Fowler. It’s really hard to say with certainty and without yDNA testing. The uncertainty of Danison Fowler’s beginnings combined with only three documents in which his name appears — the 1860 census, the death certificate for his son, and a delayed birth certificate for a daughter — gives us little to work with in examining the life he lived. Danison Fowler married his second cousin, Sarah Ann Johnson. There is no date on the Application For Certificate of Birth for Mae Jane Fowler. There is a question mark on the form for the age of Danison Fowler at the time of his death. The form was filed in 1952. Mae Jane Fowler would have been 65 years old at the time and may not have remembered when her father died. Sarah Ann Johnson married George W. Gault in 1895; it is likely that Danison Fowler had died before that time. My research into the Jasper Fowler family is ongoing. I am still hoping to find a document buried in the courthouse that will give me the name of his wife. I am also working to confirm and document the names of his other children. It is a labor of love. I am so stumped with Fernando Fowler. I’m a member of Ancestry and I only have a theory that Wright and Martha were his parents. But, that would mean she had Fernando when she was 13! I know times were different then, but that seems YOUNG. Jennie…..thanks so much for your comment! It reminded me that I had not revised the Jasper Fowler article to show newly found information. First of all, Wright Fowler and his brother Adolphus were NOT the sons of Susan Fowler, daughter of Jasper. New evidence and more research indicate that Wright and William were the sons of William E. Fowler 1827-1862 and Susan Wright b. 1833. Susan was the daughter of Joseph Wright b. 1793. William E. Fowler may have been the son of William G. Fowler b. 1805, son of Israel Fowler II, son of Israel Fowler I. DNA testing will soon prove this one way or the other. (Wright Fowler’s brother) Adolphus Fowler age 22.
about 79 in 1934 on her death certificate. Her estimated date of birth from these records is anywhere from 1852 to 1856. 62 in 1931 on his death certificate. His estimated date of birth from these records is anywhere from 1869 to 1874. Since most people had no exact knowledge of the date of actual birth, it gives us a little room to play with Martha Jane Johnson and the birth of first born son Fernando. I am sure she was very young regardless. The interesting question to me is who was the father of Martha Jane Johnson’s children Fernando, Elijah, and Lilly?? As the three children had the Johnson surname in 1880, it is possible that Wright Fowler was not their father. I have alsorecently been told by a descendant of Elijah that there was a family story that Wright Fowler was NOT the father of the three oldest children; that he married Martha Jane later and fathered her remaining children. Again, DNA testing will help sort this out. The naming pattern (Fernando, Elijah) does not fit the typical Fowler pattern. However, the presence of Adolphus Fowler in the household does lend a connection to Wright Fowler. Since there was a gap of several years between Lilly and the next child born to Martha Jane, it is possible and maybe even likely that another man sired the first three children and Wright Fowler was the father of the younger ones. I am still working on this. You persevered!! I’m only now getting back to the Fowler line! Wow! The advances you have made. We ALL thank you!